Jinan is the large province of coastal economy of the east of China and is the provincial capital of Shandong. It also remains the political, economic and cultural centre of the whole province. The best time to visit Jinan is between August and July where weather is at its best with low precipitation and warm temperatures. Whilst visiting Jinan there are some must see sights and below are the 5 top recommended sights! The Four Gates Pagoda (Chinese: 四门塔) is a Sui Dynasty (581-618 AD) stone Chinese pagoda located in central Shandong Province, China. It is thought to be the oldest remaining pavilion-style stone pagoda in China. The oldest extant brick-built pagoda in China is the 40-metre-tall (130 ft) Songyue Pagoda of 523 AD. 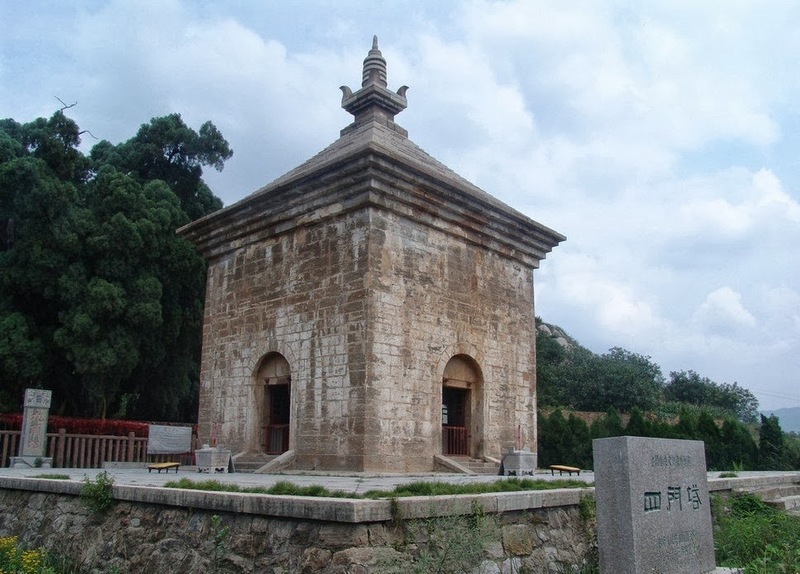 The Four Gates Pagoda is located at the foot of Qinglong Mountain, near Liubu Village, in Licheng District, under the administration of Jinan City, about 33 kilometers southeast of the city of Jinan proper. The pagoda is located to the east of the site of the Shentong Temple (Chinese: 神通寺), which was one of the most important temples in northern China at the time the pagoda was built but is now in ruins. Daming Lake Park covers a total area of 860,000 square meters (about 212 acres) of which the lake itself comprises of 460,000 square meters (about 113 acres). The six islands in Daming Lake contain flowers, trees and other plants flourishing amongst the various pavilions. The lake is a center of activity and one can find fish leaping near yachts and boats. In summer, lotuses bloom uninhibitedly filling half of the park with its fragrant scent. At the same time, willows circle the lake on three sides and swing with the breeze, a scene for which Daming Lake is famous. The centerpiece of the lake is a great man-made hectometer fountain built in 1985. The fountain has 103 injectors, and the main injector can spout water as high as 100 meters. 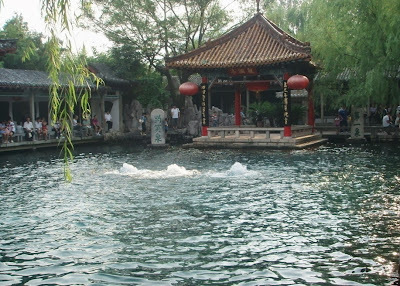 Beautiful Baotu Spring Park is located in the centre of Jinan City, and it is here that you will find the Baotu Spring. The park itself was originally established in 1956 and more recently has been extended to 158 mu (about 26 acres). This highly valued facility represents the symbol of Jinan City and is regarded as one of the three major places of interest in Jinan. This park is highly regarded as a well known scenic spot which makes an ideal location for admirers of wonderful natural springs, culture and various constructions. The Baotu Spring Park has memorials of Li Kuchan, a master in traditional Chinese Painting, Wang Xuetao and Li Qingzhao. The park also holds performances of Peking Opera all year round. 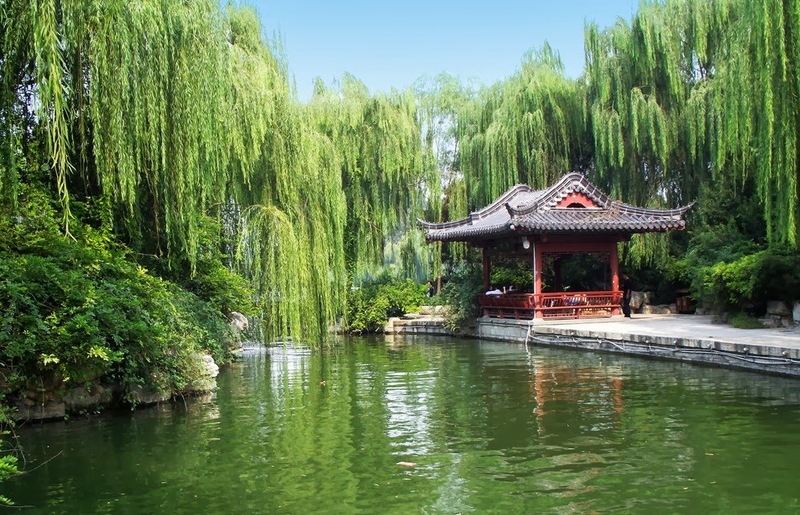 With ten cultural features, including the spring, rocks, opera performances, lanterns, chrysanthemum, calligraphy, paintings and stone tablets, the Baotu Spring Park has become a world famous tour spot. Thousand Buddha Mountain (Qianfo Mountain) is located about 2.5 kilometers southeast of the city at 285 meters above sea level. It is one of the three most famous scenic spots in Ji'nan and occupies an area of 166 hectares. 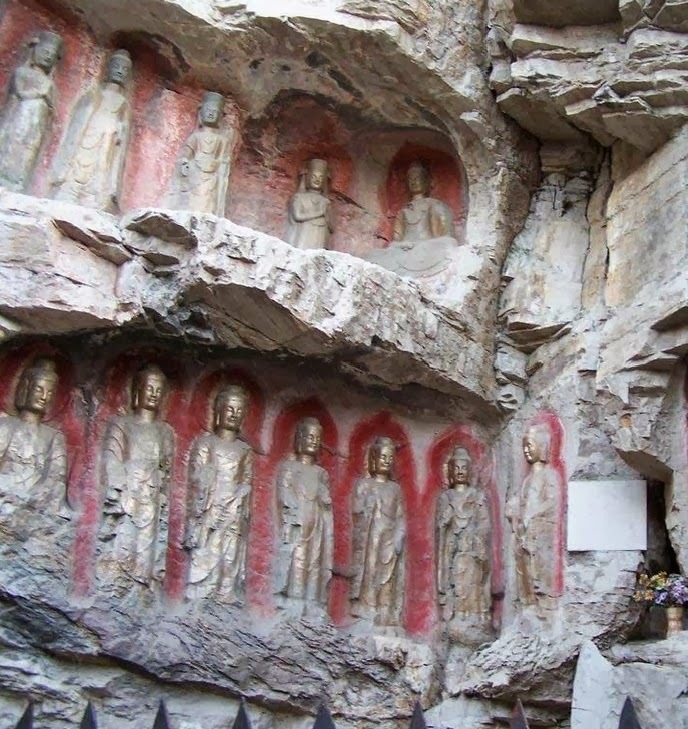 During the early years of the Sui Dynasty (581-618), Buddhism became popular with people in the area and Buddhist disciples built many temples and carved numerous Buddhist statues on the rocks of the mountain, hence the name. 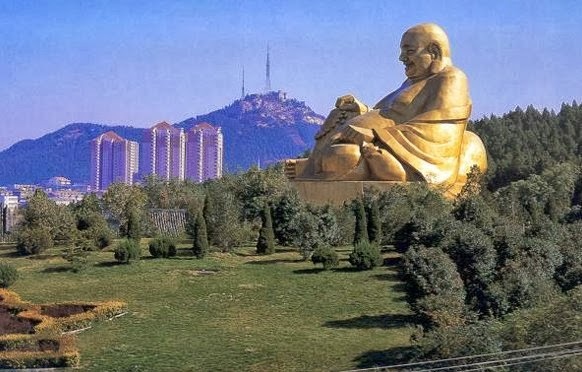 The Thousand Buddha Mountain Park, many objects were built, such as garden peach blossom, cableway, the strange slide ways, Yingfang garden, the eighteen disciples of Buddhas, sleeping Buddhas, stone garden, golf courses, waterfall, theatre, the picture of stone of the Shun garden.